UGQ’s PENNY PINCHER Series of catenary cut tarps is designed to keep you and your gear dry in any weather all while keeping money in your pocket. These tarps provide you an AMAZING VALUE while still using all the same fabrics and materials as our SilPoly HANGER Tarps and SilPoly WINTERDREAM Tarps. By securing a deep discount on bulk fabric and limiting options we are able to offer these at an INCREDIBLE SAVINGS to you. Available in FIVE popular tarps sizes, the HANGER11WB, HANGER 12, WINTERDREAM 11, WINTERDREAM12 and the WINTERDREAM 13, in our most popular fabric/color combinations. All Tarps are MADE TO ORDER and ship from our shop located in Jackson, Michigan, USA. 20d 1.1/oz Sil/PU Polyester – Featuring 2nd generation of our silicone double coated 1.1 oz. polyester ripstop (SilPoly). This fabric is coated with a silicone/PU layer on each side and is waterproof/non-breathable. In addition to excellent waterproof/windproof characteristics, SilPoly offers lower water absorption and increased UV resistance compared to SilNylon. Particularly useful in outdoor applications to minimize sag/stretch when wet and color fade over time. All tarps have Triple Stitched Polyester Modified French Seam Ridge with double split ring ridge connection, Black Polyester double stitched reinforced structural edge tape detail and our unique double split ring “ZERO STRESS” tie outs. Stakes, Guy Lines and Tarp Ridge Line NOT INCLUDED. All Tarps are shipped with a Modified French Seam Ridge, while this type of seam is less prone to leaking with proper setup you may desire to seam seal it to insure a dry pitch. DISCLAIMER: Due to monitor setting, monitor pixel definitions, the limitations of desktop scanners, digital photography, and dye lot variations, we cannot guarantee that the color you see on your screen is the exact color of the product. We strive to make our colors as accurate as possible, but the images on our website are intended as a guide to help you choose your items. All colors on the website are approximations of the actual colors. For best results, view this page with your color depth set to 16-bit (thousands of colors) or higher. If you’d like an actual sample swatch of fabric delivered to you so that you can see, touch, and evaluate the quality, color, and finish, please feel free to send us a request via email. Colors may be discontinued without notice. If you place an order for a color that is unavailable, you will be notified via email, at which time you may either select an alternate color, or request a full refund. Black 100% Polyester is used for all edge tape, ridge tape, and guy outs. For storage you have several choices available to you. First a 40d SilPoly ToughSACK sized for your tarp. Looking for something different, try our Tarp Sleeves, available in eight colors sure to compliment your tarp. Tarp Sleeves come in one size fitting tarps up to 12″ fully, 13″ tarps will extend out the ends slightly. Both the ToughSACK and Tarp Sleeves are available at an additional cost. Don’t need either than we’ve got that option as well saving you a few bucks. Center pole mod includes webbing and grommets installed on tarp for installation of our Center Pole Kit (SOLD SEPARATELY). End pole mod includes webbing and grommets installed on tarp for installation of our End Pole Kit (SOLD SEPARATELY). Pole mods are available as an add-on at additional cost. If you are planning on using any internal poles it is recommended that you seal the ridge seam with an appropriate sealant to avoid any potential leaks. Seam Sealing Kit includes 1.5oz silicone sealant and 1″ foam brush for a nominal cost. Suitable only for Silnylon or SilPoly tarps, not for use with PU Coated fabrics. Available as an add-on at additional cost. A really solid tarp. I like the snap closing doors; they come in real handy when your camping in cold and windy conditions or when it’s raining. I’m so impressed with UGQ and this tarp! I’m putting together my first-ever hammock camping setup and did a ton of research to figure out the best product at the best value. 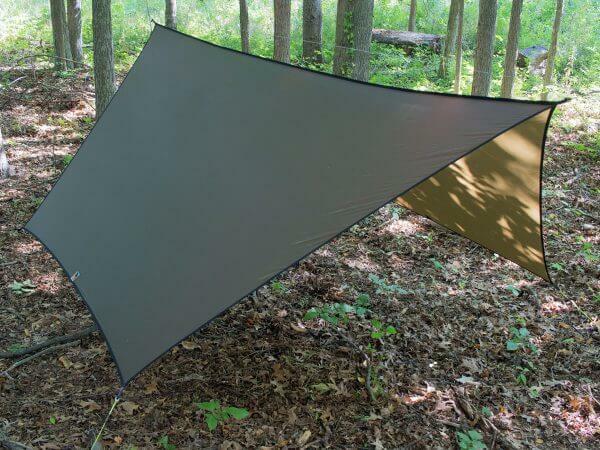 This penny pincher tarp, coupled with the Arrowhead Equipment simple single carribeaner ridgeline seems to have fit the bill perfect for easy setup for this newcomer. On top of that the customer service was simply amazing and I really appreciate the personal response, and personalization with a request for a specialty color double-sided stuff sack. After all the research I can’t iimagine a better product or experience for the price. A very well constructed tarp. Stitching is perfect. I really like that all edges are trimmed in grosgrain. I know they say you don’t have to seam seal the ridgeline, but I strongly encourage it. Can’t say enough positives about the quality of the craftmanship of my tarp and the customer care I received from Paul and Missy! Save some money. Quality materials and construction. 4 stars because haven’t had in rain yet. Light and packable. Received faster than expected. Friendly customer service along with an amazing quality piece of gear! Tarp is a great value also! Awesome product and a great company.